When the architect George Livissianis opened his eponymous practice ten years ago, he began where all great ideas do: with a pen and a drawing board. Now, he says, it seems as if he is “the only one in his studio who can’t think without drawing – with a pen, that is. Working within “the parameters of being simple, minimal and functional” has done little to limit Livissianis’s impact. The architect has created some of Sydney’s most impactful dining rooms, particularly on within a one block radius in Potts Point. 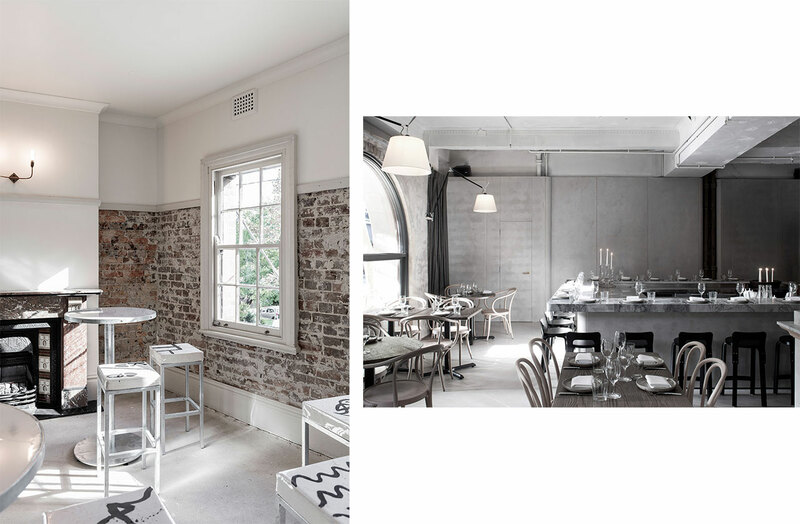 Most notably, or perhaps most formative as far of recognition of his work is concerned, there’s the muted greys and stripped back concrete walls that couch his friend Jonathan Barthelmess’s reimagined take on Greek at The Apollo, in both its original Potts Point venue and at the recently opened restaurant in Tokyo’s Ginza neighbourhood. There’s the perforated blond wood, communal concrete bar and brass flourishes across the road at Cho Cho San, another Barthelmess venue. Nearby, dark wood and raw terracotta walls set the mood at chef Kylie Kwong’s second iteration of Billy Kwong, in much the same way that they do at the many textured Longrain in Surry Hills. For Maurice Terzini’s total refurbishment of The Dolphin, Livisiannis created an interior (also shortlisted in the Hospitality category of the Australian Interior Design Awards) that’s equal parts Christo and Jean-Claude meets Keith Haring meets Martin Margiela, encasing walls in canvas and rope to create a padded cell for those driven mad by natural wine and chicken cotoletta. A similar effect is achieved at St Kilda’s seaside phoenix Pontoon, where rope-bound raw concrete pillars soften the brutalist edges of a recent rebuild. As recently as August last year, Livissianis was charged with the $5 million total revamp of Matt Moran’s Aria at Circular Quay. Perhaps with the exception of Billy Kwong, all are drenched in natural light. Examples of Livissianis’s residential work are harder to come across; he does not keep a portfolio on his website, which, with its sparse white background and contact details whittled down to his faithful muted grey essentials, functions more like a digitized business card than anything. Earlier this month, Livisiannis received his third Australian Interior Design Award for his work creating Jac+Jack’s Gould Street store – his fifth for the brand (there are now three in Sydney, one in Melbourne and one in London). Raw concrete encases the space like a shell, the outlines of which are illuminated using linear lighting. A neutral gray and white palette, immaculate bespoke joinery that appears to float and an innate consideration of material and detail echoes the prevailing palette and principles of the clothing itself. 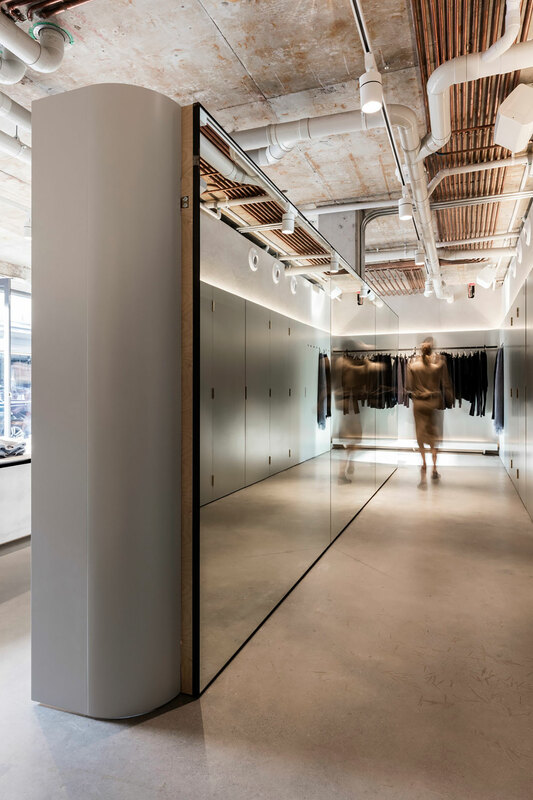 “This was our fifth Jac+Jack store so we have had the opportunity to refine our past work and to see the spaces with more clarity and connection to the product”, he says. Devising the concept required Livisiannis consider the essence of the brand, their product, the location and the existing space, all of which tells him what is required and informs his eventual choice of material and fit out. To his mind, a harmony between each is what ultimately makes the space a successful one. Private residential projects notwithstanding, you’ll next be able to see Livisiannis’s work at Maurice Terzini’s new venture slated for an August opening, Bondi Beach Public Bar, for which Livissianis apparently concocted close to twenty design concepts. 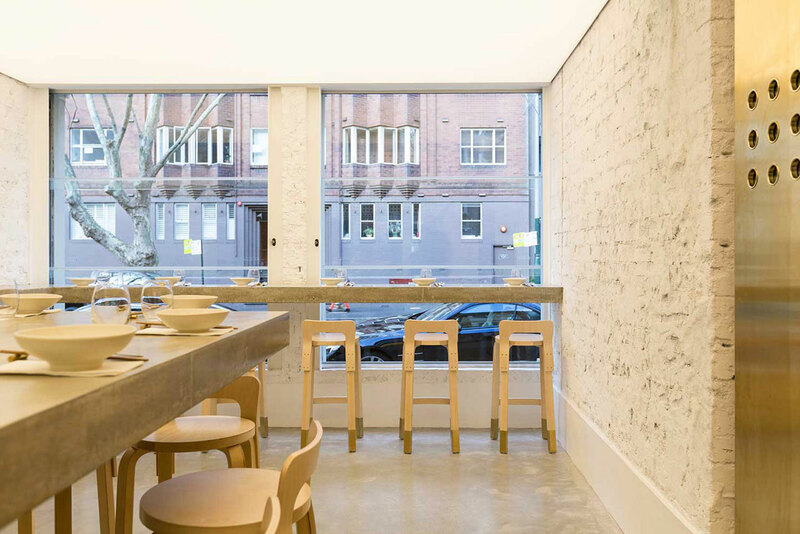 Then there’s the highly-anticipated arrival of Chin Chin in Sydney, also slated for an August arrival in the historic Griffiths Tea building in Surry Hills. It will be owner Chris Lucas’s maiden voyage north of the border and if the popularity of the Melbourne original, which opened in 2011 and still enjoys a full-house each night, is any indication then a great deal many more people will become well acquainted with Livissianis’s work very soon. It may sound like as though he’s taken on a great deal, but Livissianis insists that the greatest challenge he’s currently facing is something far removed from the world he has created for himself and his clients. “Fake furniture. I think the answer is simple: choose something original and well-designed that suits the budget and is long lasting.” In a word: choose George.